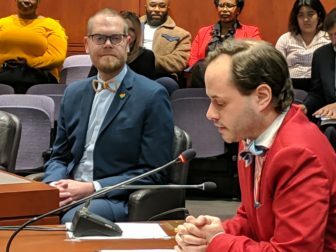 Patrick J. Dunn, executive director of the New Haven Pride Center, speaks in favor of a bill that would establish a health and human services network for the LGBTQ community. Rep. Jeff Currey, at left, co-introduced the bill. Currey, who introduced the bill, along with Rep. Raghib Allie-Brennan, D-Bethel, said the $250,ooo would serve as “seed money” to help gather data for securing grants from the private sector. The network would consist of representatives from more than a dozen health and human service non-profit agencies as well as some state agencies. Conor Pfeifer, a development officer with Triangle Community Center. 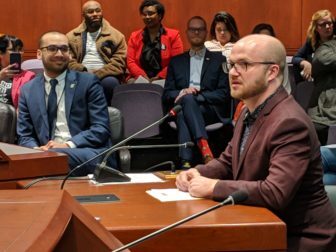 voices support for a bill to establish a Lesbian, Gay, Bisexual, Transgender and Queer Health and Human Services Network. Rep. Raghib Allie-Brennan, at left, co-proposed the bill.